The English Wikipedia corpus is an English corpus created from the English internet encyclopedia Wikipedia in 2014. In the process of building this corpus, Wikipedia dump was used (from the second half of September 2014). The XML structure was converted using WikiExtractor.py. The corpus contains 1.3 billion words and texts are lemmatized and morphologically analyzed. The corpus was POS tagged with TreeTagger using Penn TreeBank tagset. 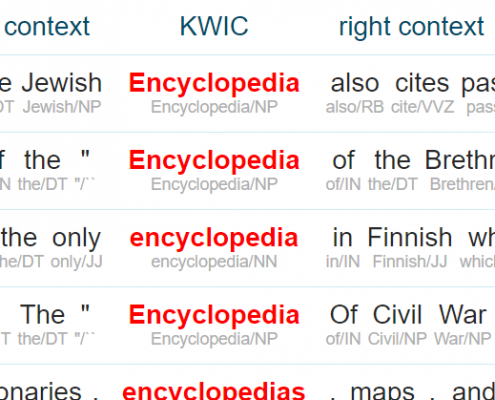 Generate collocations, frequency lists, examples in contexts, n-grams or extract. Use our Quick Start Guide to learn it in minutes.